Last year, Intel set an ambitious goal to be the first high technology company to reach full representation of women and underrepresented minorities in our U.S. workforce by 2020. 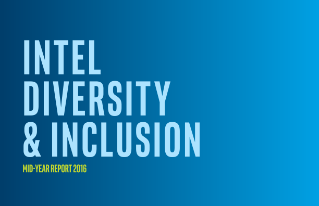 We committed $300M to support this goal and accelerate diversity and inclusion—not just at Intel, but across the technology industry at large. The scope of our efforts spans the entire value ...chain, from spending with diverse suppliers and diversifying our venture portfolio to better serving our markets and communities through innovative programs like Hack Harassment, which aims to combat online harassment. Intel is evolving, and diversity and inclusion are among the most important forces driving that evolution and reinvention. Our commitment to diversity comes from our conviction that reaching a critical mass of women and underrepresented minorities in our workforce brings ample benefits. These go far beyond the business benefits to Intel—which are many—to include the entire tech industry and our wider communities beyond. Inclusion means ensuring that all employees are, and feel, free to bring their full selves to work, offer their true and unguarded perspectives, and find a welcoming and inviting place for those ideas. True change is made through both diversity and inclusion. Together, these concepts are transforming and defining our culture and how we all work together at Intel. Intel For Change student ambassadors identify barriers to education in India.